Paramecium is a well-known genus of ciliate protozoa (single-celled eukaryotes, generally grouped in the kingdom Protista) of the phylum Ciliophora, commonly studied as a representative of that group. Paramecia are unicellular and slipper-shaped organisms found in freshwater environments, ranging from 50 to 300 μm in length, depending on the species. Simple cilia, tiny hairlike filaments, cover the body, and there is a deep oral groove, containing inconspicuous compound oral cilia, as found in other peniculids (order of protozoa). These cilia aid in both movement and in moving food to the oral cavity. 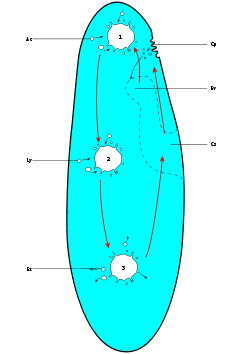 As simple as paramecia are, they nonetheless exhibit a rudimentary sexual reproduction, whereby two paramecium come together, conjugate, and exchange genetic material. Thus, even at this basic level, sexual reproduction is revealed as a nearly ubiquitous characteristic of living organisms. Some species of paramecia also form harmonious, symbiotic relationships with algae, with algae providing the products of photosynthesis to the paramecia, while receiving a habitat in which to flourish. The hair-like cilia that cover the outer body of the paramecium are in constant motion, helping the organism move along at a speed of four times its own length per second. As it moves forward, it rotates on its axis, which aids in pushing food into the gullet. It can move backwards by reversing the motion of the cilia. Food enters the food vacuoles, which cilia push into the gullet in a process known as phagocytosis, and is digested with the aid of hydorchloric acid and enzymes (Raven and Johnson 1996). When digestion is complete, the remaining food content is emptied into pellicles, known as cytoproct. Osmoregulation is carried out by a pair of contractile vacuoles on either end of the cell, which actively expel water absorbed by osmosis from the surroundings. 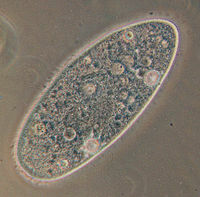 Some species of paramecia, such as Paramecium bursaria, form symbiotic relationships with photosynthetic algae. In this case, the paramecium is able to grow certain algae within its own cytoplasm. Living inside of another organism provides a safe habitat for the algae, unless food for the paramecium is scarce, in which case the algae will be consumed for nutrition. Paramecia are rare among the eukaryotes in that they have two different types of nuclei within their cells. Micronuclei contain normal diploid chromosomes, divide by meiosis, and undergo genetic recombination. Macronuclei are derived from the micronuclei, but contain multiple copies of the genome and the DNA is divided smaller than individual chromosomes (Raven and Johnson 1996). The macronucleus is responsible for everyday activities including growth and reproduction, and the micronucleus remains dormant until the cell reproduces. Most paramecia undergo cell division, binary fission, dividing the cell into two new cells that rapidly grow and develop into the new organisms. This process can happen up to three times a day if the conditions are right. While paramicia usually reproduce asexually, when food supplies are low, they may reproduce through a form of conjugation, the transfer of genetic material through cell-to-cell contact. Two paramecia fuse together, including the nuclei within each cell, after which they divide into four separate parts. In this division process, the organisms undergoes meiosis, and the diploid micronucleus divides twice, resulting in four haploid micronclei. This combination of two different genetic individuals and mixing of chromosomes is the basis of sexual reproduction. Progeny from conjugation must reproduce asexually 50 times before they are able to perform conjugation, after which their biological clocks are restarted, allowing for conjugation. Death follows after about 100 generations, because of protein degradation around the gullet, which prevents them from finding a mate. A number of doubtful species have also been recorded. Paramecia are widespread in freshwater environments, and are especially common in scums. Paramecia are attracted by acidic conditions, since they feed on bacteria, which often slightly acidify their surroundings. They are an important link in the detrital food web in aquatic ecosystems, feeding on bacteria and dead organic matter often associated with these bacteria, and being preyed upon by protists and small animals. Margulis, L., H. I. McKhann, and L. Olendzenski. Illustrated Glossary of Protoctista. Boston: Jones and Bartlett, 1992. Raven, P. H., and G. B. Johnson. Biology. Wm. C. Brown Publishers, 4th ed., 1996. Wichterman, R. The Biology of Paramecium. New York: Plenum Press, 1986. This page was last modified on 26 September 2011, at 18:24.